You are getting or already own an English Bulldog, so what are the things you should have on hand to keep your bulldog looking fabulous? Here is a list of some of our favorite items, and some things you should have on hand in case you need them. Good Dog Food. This is the MOST IMPORTANT thing of all, to make sure your bulldog is getting all the nutrition and benefits in their diet that they should be getting. Healthy Treats. Giving your bulldog great dog food can be backfired if you give bad treats. No pupperonis or Bacon snacks! Find treats that are natural, preferably grain free. Fresh and Frozen Vegetables and Fruits. Give these as an alternative to store bought treats. Frozen Green Beans are my personal favorite, almost no calories and no sugar, just vitamins! Yogurt. Give them a spoon of yogurt on their food as an extra treat. Yogurt aids in healthy digestion. Note that if your bulldog is overweight, you may not want to do this with every meal. Canned Pumpkin. Canned Pumpkin is considered a 'super food'. This is NOT pumpkin pie mix, but all natural pumpkin. Keep this on hand if your bulldog is not moving the bowels correctly, it is full of fiber and will help get the pooping process going. You can even freeze it into ice cubes to give as a snack every other day. Do not over use canned pumpkin, or it will give your bully the runs! Salmon Oil or Coconut Oil. Add salmon oil or Coconut Oil to their meal at least once a day to keep their skin healthy and shiny! Supplement. Adding a supplement such as NuVet Plus to their diet can help build the immune system and keep them healthy! Good Shampoo. Get a shampoo that will help aid the moisturizing of the skin, and help keep the coat soft and shiney. Oatmeal based is great if there is not a bunch of added perfumes and dyes. I personally use Tea Tree Oil Shampoo, and if you have a bully with allergies you can get a prescribed anti-fungal shampoo from your vet. The shampoo you use could make all the difference in the world when it comes to bulldog itchiness. Snout Soother, Aquaphor, or coconut oil. As your bulldog ages, so does their nose. In dryer climates, the nose can become crusty looking. In my experience, vaseline does not help. Snout soother is all natural and keeps bully noses moist, and you can also put it on dry paw pads as well. Baby Shampoo. Wash the top of the head and ears with baby shampoo. Just in case it gets into the eyes, it will not sting them. Cotton Balls. Put a cotton ball into each ear during bathing by stuffing it in so that the entire ear opening is covered. This will keep water from going into the bulldog ear canal, which is deep. If water gets into the ear canal, your bulldog will get an ear infection. Do NOT FORGET TO REMOVE THEM after the bath, and make sure they are in good enough so they cannot 'shake' them out during bath time. Good Nail Trimmers/Dremmel. Get a good pair of nail trimmers. Keeping bulldog nails trimmed is extremely important. The more often you trim the nails the better. If you let their nails grow long, the quick grows with them. Then when you try to trim them back, you will cut the quick. This is very painful for your bulldog! I use trimmers to cut off any access nail, then use a dremmel to file them down as close to the quick as possible. I love my dremmel and will never cut nails again without it! Bar Soap. Yep, keep a bar of soap handy, just in case you cut the quick during nail trimming time. Push the cut nail into the soap to clog the bleeder. It is kind of like putting a cork on a bottle. If you don't have soap handy, you can use flour or cornstarch. Acne pads (like stridex but just the generic brand) or Witch Hazel. This will help kill bacteria and dry out moist areas like wrinkles and creases. Diaper Rash Ointment. You can apply diaper rash ointment like Desitin in wrinkles to keep them from getting moist. Make sure the wrinkled area is completely dry prior to application, and keep away from the eyes. Do not allow them to lick it either. Apple Cider Vinegar. Mix 1 part ACV with 3 parts water to ward off yeast. Epsom Salt. Soak your bully's paws in Epsom Salt if they develop interdigital cysts. Hydrogen Peroxide: Use Hydrogen Peroxide if your bulldog has a fresh open wound. You can also mix Peroxide with Cornstarch to make a paste that can be used on stubborn tear stains. Neosphorin or other anti-bacterial ointment. Keep this on hand to treat wounds that are scabbed over. Gold Bond Powder. Use a pointed tip plastic bottle (such as a ketchup bottle or hair dye bottle) to get the powder in the desired areas. Use Gold Bond on moist wrinkles and tail pockets, or especially if they get any diaper rash. Dental care: Don't forget those toofies! Dental brush and paste, or you can also get the finger cleaners. Chew toys also promote dental health, we do NOT recommend 'Greenies' or other dental chews due to the ingredients. Benadryl. Get 25mg benedryl tablets and keep them with your bully at all times. If your bulldog gets hives or an allergic reaction to something, this could save their life! 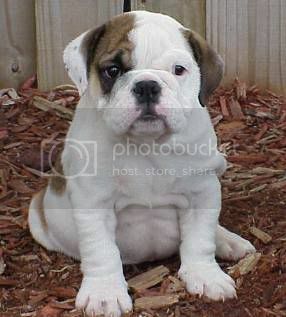 The dosage is 1mg per pound, so a 50lb bulldog would get two 25mg pills. Panalog Ointment from your vet. Most vets will prescribe panalog to you to keep on hand. Other names for this are Animax or Entoderm ointment. If you bulldog gets yeast, bacteria of fungus in the nose rope, tail pocket or any other deep wrinkles, putting a bit of panalog in there will get rid of the nasty bacteria and the smell that stems from it. Depending on how bad the area is, will depend on how long you should use it for, and how long it takes to go away. Lemon Juice. If your bulldog becomes overheated or overexcited, their airway can become blocked. Squirt some lemon juice into the side of their mouth, or under the tongue. DO NOT put it down their throat, or they could aspirate it!!!! Take lemon juice with you to the park, on walks, or anywhere they can get overly excited. Collars, Leashes, Charms, Harness. You just got an English Bulldog, so you must show them off! They will draw more attention than your average dog, so don't forget to deck them out in plenty of fabulous items! Wardrobe. If you love to dress your bully, make sure they have a fabulous wardrobe with stuff that FITS bulldogs! Toys, toys and toys! Bulldogs love their toys, and love to chew! Make sure you get toys that are tough and can hold up to your bulldog. Remove smaller toys from their puppy box as they grow. Empty Water Bottles. These make a fabulous play toy, but never leave unattended! A nice camera with video capabilities. This is a must for every bulldog owner, so you can supply our members with plenty of photos and videos of your bully! A 4 Paw Membership to English Bulldog News of course! A Gas Mask and Earplugs could also come in handy. Great advice, you covered everything! Wow, there are only 4 things on the list I don't have! Amazing! GREAT article, thank you! there are a few things i need to add to Bullet's 'bully bag'. lol he literally has a diaperbag with his necessities. That was great printed it out and definitely gonna use it. Didn't see a water/squirt bottle to give the dog water if you are in a car or out for a walk.?? Heard that was good to have also. What a great list! Am definitely going to print it out and make sure we have everything on it. Like Bullet, Frank has a bully bag too! Great for all the care that they need! A terrific list....definitely a keeper! Thank you. Very good article. And as other have stated, I have learned something new. This is why it is SO important for people to talk to other owners and share information. Thanks, i will be certain to pass this on to other as well. Hi there, great article. I didn't notice on here about dental care and the importance of dental cleaning. My bullies don't care for the toothbrush, so I actually use the finger brush on them. Use Canine toothpaste not human toothpaste. One other thing that is of great importance is to KNOW exactly where the nearest EMERGENCY ANIMAL CLINIC is located. I don't mean knowing the address but to actually drive there. In 2008 I lost my 5 month old female bully due to aspiration. I had never been to the emergency clinic prior, and on the tragic date I had a hard time finding the location even though I knew the address. I strongly recommend taking a Pet CPR class. I did after my loss and today I am more aware and ready should I ever need to use it. I hope my comments are helpful. Thank you for your time. This is a great article! I never thought of some of those things. I'm really tempted to go out and buy the salmon oil for Delilah and the acne pads. good info!!! need to go buy some stuff!! thanks! Well..@desertskybulldogs..I wish I would've had this yesterday! Jake got stung by a bee..err..he DID try to eat it first..so I had to run to target at 8pm..his bottom lipped swelled up and he looked so sad!! I thought I had some in my earthquake kit..but noooo..had gotten into that kit and given to my daughter for my granddaughter!! Going to print this out and be prepared! Thanks. Great info. Happy to say that I've using some of these items right now and they are working great. Healthy pooch so far!